The last week has been quiet and I’ve been unbalanced. I’m hoping it comes from the change in barometric pressure. When I get this tippy, I hold on for dear life. Last week was the first time I’ve seen a doctor in three years. I have Medicare now and thought I’d get acquainted. As I walked down the narrow flat-yellow hall to the doctor’s office, I almost went completely over. I’ve never had that reaction before. It’s like the wall was moving. No one seemed concerned. The doctor wasn’t happy with me because I refused the flu and pneumonia shots. I take no medications and other than residual effects of Bells Palsy, I’m quite healthy and work to stay that way. He really didn’t want to address anything to do with the Bells. So the time down has been spent reading a great deal. 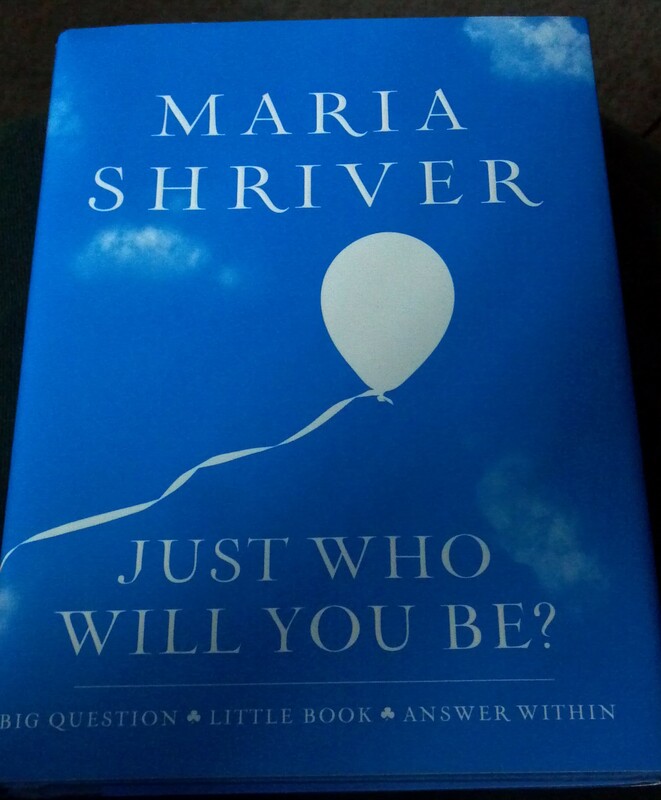 I received this little book for my birthday from my ex-daughter-in-law. It was a quick read and I enjoyed it. I don’t think we ever get done growing ourselves into who we want to be. The idea that we are supposed to stay the same while life changes all around seems ludicrous. I was a sweet easy read. Gave me some food for thought. The mail last week brought this beautiful sympathy card from the wonderful Alys at Gardening Nirvana after I had to let sweet Gracie go to her final sleep. 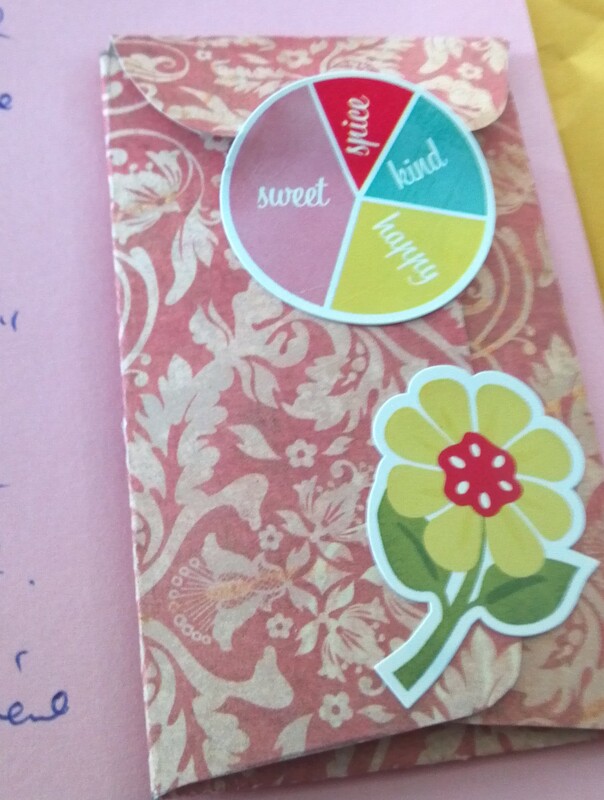 The colors in the card reminded me of another blogger I love to follow. I wonder who that could be? I had to sit with the kindness and thoughtfulness for several days. I’m not usually on the receiving end of these things. She is a woman of many talents and an extremely large heart. I love blogging just because I get to meet such terrific people. I mentioned to Bethany at Journey to Ithaca that you don’t have to see or talk to people to know their hearts. It comes out in their writing. There are so many like them that keep me going when the going gets tippy. Loved the colors. Reminds me of someone? 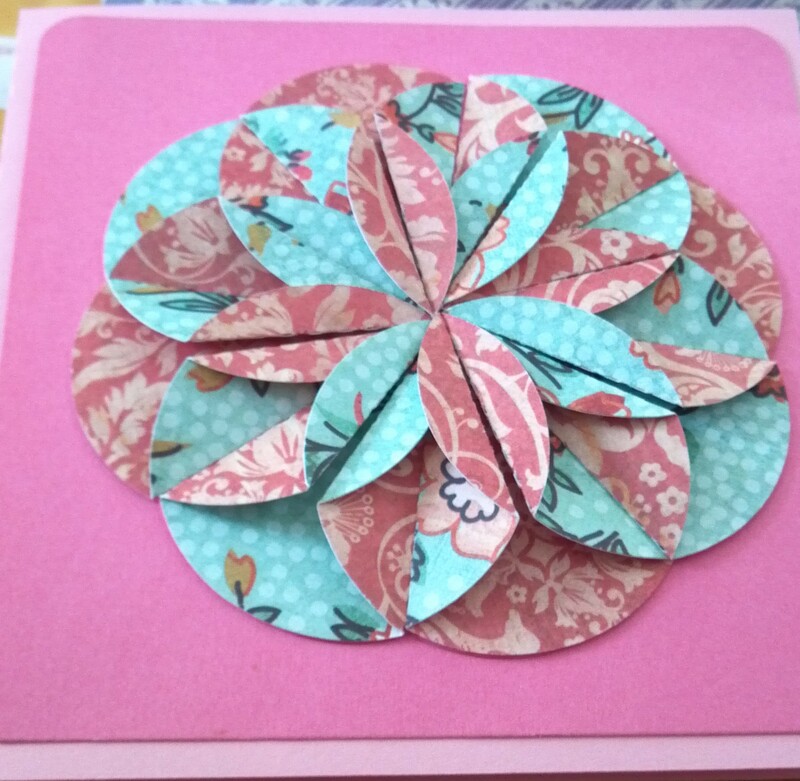 Little envelope inside card. All handmade. She made the whole envelope as well. How talented can a person be? Not all my time has been spent in a book this week. My daughter was over on Saturday to bake chocolate chip cookies for her handyman friend. My kitchen is bigger and brighter so the baking goes so much easier. The cookies are for barter. The friend puts her AC unit in her window in early summer and removes it when the weather has turned cool. Yes, we are there once again. Since he will take no cash for the few minutes it takes and loves (homemade) chocolate chip cookies above all else, we put the oven to good use heating the apartment at the same time. The other half went to work with her to entice them to hire her on permanent. 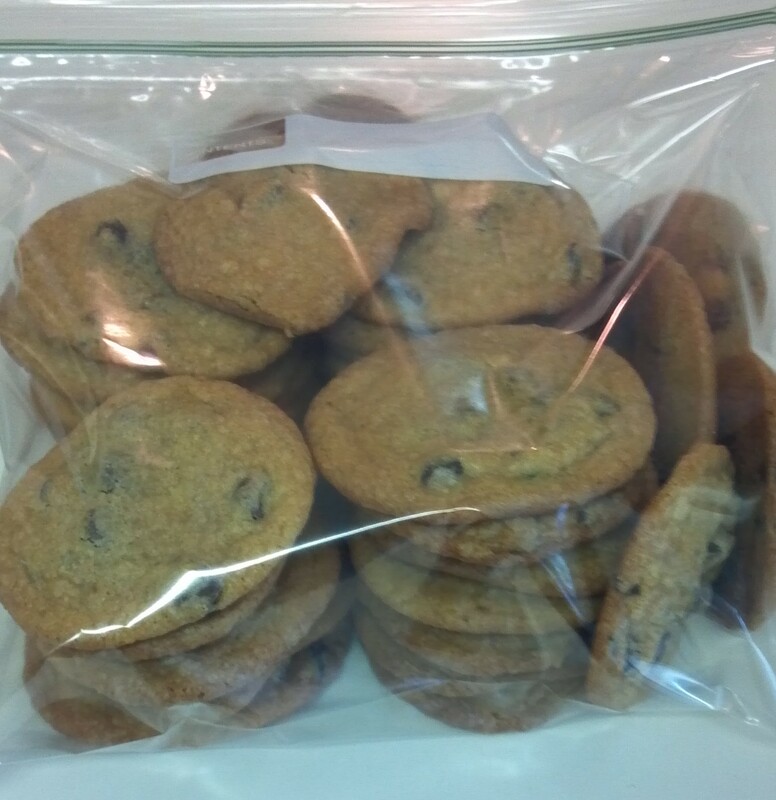 Since the temperatures have been dropping like a rock and I had the ingredients, I baked up another 9 dozen cookies and stored them out of my reach. Warmed up my toes and I’ll be ready to pass them out for all the holiday events. Yes, I start early. The holidays take a lot of energy so I have to be strategic with it. Sorry to bring the subject up to those that aren’t ready to deal with it. Cold weather does that to me. How are you bringing a little balance into your life? Are you finding the weather is throwing you more curves than you field? Is it summer, fall or winter where you live or changing every day? Thank you so much for your kind concern. The worst of the tippiness has passed and it’s back to the normal amount. I got you note just fine. One day when I can travel again, I’d like to go visit down under. Have so much family in Australia and New Zealand would be close by. Until the, it’s just virtual visits. Thanks so much for reading. I enjoy all my blogging friends so much. 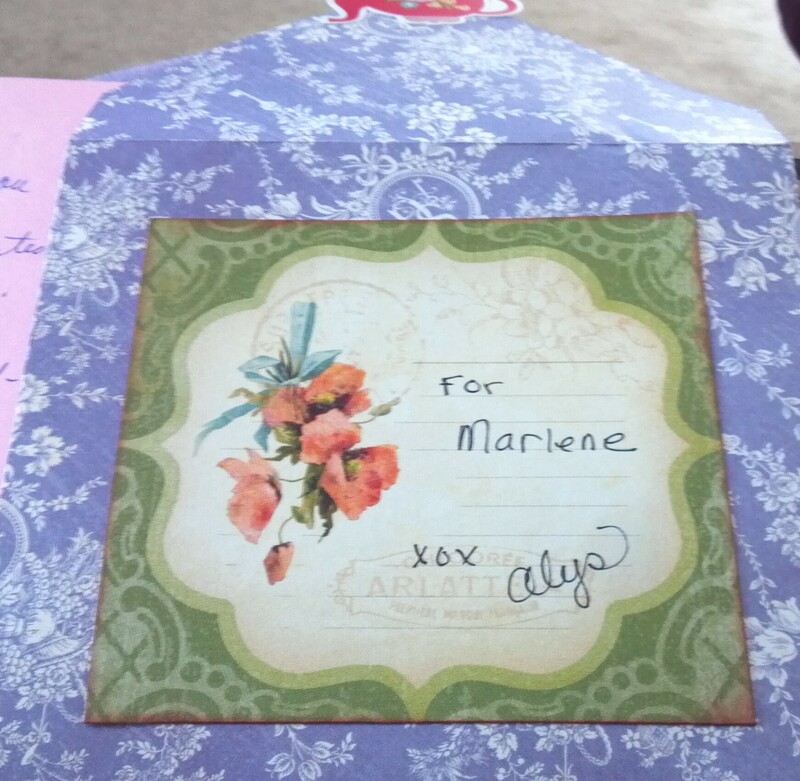 Marlene, your posts are so honest and heartfelt…I truly enjoy reading your thoughts. Hope to see you in class next week. Thanks Missy. We missed you this week. It’s a full house with 17 of us. Hope you were out having fun. Marlene, I’m so sorry you are experiencing more problems with the Bell’s Palsy. I congratulate you for standing up to the doctor but if he’s not interested in talking to you about the Bell’s I’d be looking for another doctor and fast. How dare he not listen to what you need. The weather here isn’t sure what it wants to do. This morning I headed out about 10, it was so cold I wished I had grabbed a pair of gloves.By noon it was in the 70s and I was removing layers. By 2 it had cooled a bit and had what can only be referred to as a summer shower. it’s crazy. I hope the weather holds as there will be plenty going on this weekend with the university celebrating homecoming and I promised my granddaughter I would go with her to the parade. Christmas I always start early. I rarely know if I can get out later with the weather. Today I picked up a few things for the grandchildren for Halloween, I don’t give them candy and bought all the gifts for my youngest son and his wife, and am half way done with the other two grand children. All I have to do now is my oldest son and his wife, at least with money. I have a few more things to finish making but the supplies are already here. Thanks for reading Lois. I don’t have much patience with doctors anymore. They are after all, practicing. Wow, a parade! I hope you make it. The weather is in the mood to change by the moment. So layers it is and gloves in the pockets. I am busy trying to make warm shirts that fit. Have no winter clothes now but plenty of fabric. I want to be done with gifts by Dec 1. Then I can enjoy the season. Thanks again. I didn’t have patience with doctors as a child and it’s only gotten worse. I have real issues with my records now being online too. I don’t like the knowledge anyone can hack in. It’s no one’s business but mine and my doctors. The parade was lovely, not as big as it used to be but fun for all. I’ll share pictures soon. I have never made my own clothes but am working up to it but starting small. If I can make clothes for the little ones and alter things for my daughter-in-law then I will feel more confident to start on things for myself. Today started off chilly but by the time the parade started it was in the mid 70s, such a nice day. Well phooey on Bells, sorry you’re having a difficult week my friend. Leave it to you to not sit on the sidelines. The baking was a great diversion. Besides smelling good, you got to spend time with a loved one. I could never have those in my house, I’d eat them all. Marlene, sorry to hear you haven’t been feeling too good lately. I have been away from blogging for a while and like you say, I really missed all my virtual friends. Hopefully will now be able to get into it again. Take care. Thanks Crafty. I’m better already. Have good days and some not so well balanced. That’s life but it can slow down the progress of projects. Glad to see you back. Marlene, sorry to hear about the upsurge with the Bells. Further, its no help when your doctor can’t give you what you need…and an ear to listen and really here. I’m so glad the card brightened your day. PS I have two friends with vertigo who got tremendous relief from symptoms using acupuncture. My sister, who has MS, also gets relief from her symptoms as well (though it isn’t a cure). Finally, I have a third friend that completely eradicated her migraines after three treatments. If you aren’t getting answers via the traditional route, that might be something to consider. I realize this is unsolicited advise and hope you’ll take it as such and feel free to ignore this last paragraph. Be well. Thanks Alys. Glad you enjoyed the card. It didn’t quite turn out how I’d planned. Maybe I’ll eventually get it perfected. I’ve tried considerable acupuncture as well as chiropractic, etc. Each thing helps a little as I continue to heal. Odd things like a solid yellow wall turn things upside down for a week or so, then I find balance again. It’s in the vision center of the brain and will take longer to heal. It’s requiring so much more patience than I have. Blogging helps me keep from losing myself while I wait and wait. Things like MS never go away so I count my blessings. I have the potential still to get well. So many don’t. Some things ARE meant to be broken- very complicated and difficult lesson to learn. Thank u for this. Thanks for reading and commenting. The quote seemed appropriate to me. So many won’t get it. I read lots of Abraham so I understand contrast. Tough but necessary.